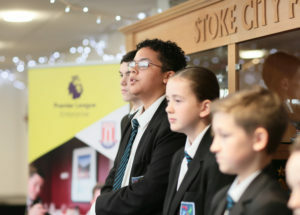 Five of our Year 9 students did themselves and the Academy proud as they took part in the Premier League Enterprise Challenge in conjunction with Stoke City Football Club. A team from each school works to produce a business idea to meet the challenge set by Premier League Executive Chairman Richard Scudamore. The teams are then invited to the stadium to take part in a club heat where they pitch their idea “Dragons’ Den” style to a panel of Stoke City judges. The winning team then goes on to represent Stoke City FC in the regional playoff in competition with four other clubs for the right to compete in the final in London. Competing against older students, Tegan; Tyreese; Ben; Owen and Ben came an incredible 2nd as they wowed the judges with their idea and confidence. Their idea – ‘Get intu Stoke City’ – centred around getting a younger audience to buy season tickets for Stoke City by offering them discounts at the intu Potteries Shopping Centre. The five students invited Potteries Shopping Centre General Manager Paul Francis to the Academy to pitch their idea, and he was very impressed by the concept. They also went into a high level of detail as they laid out marketing costs; production costs and the potential profits both Stoke City and the Potteries Shopping Centre stood to make. After a strong presentation at the BET365 stadium, our students came a strong 2nd and were invited to take part again next year. Head of Year 9 Mrs Hewitt added: ‘They were amazing and impressed the judges with their confidence and ‘Get intu potteries’ idea. They came second place but were up against Year 10 students! The competition was for Year 10 students but we proved age is not a barrier! Thank you for making us all proud and showing how fab Co-op Academy students are, here’s to next year.